Below you can find a guide to obtaining all Nightmare Tide notoriety from dailies to Expert dungeon boss drops. Notoriety vendors provide runes, essences, some companion pets, minion cards, costume capes and even an 155% mount (for Manugo League). You can access all these items in the RIFT Store. Runes are found under RIFT Store -> Equipment -> Runes. Essences are found under RIFT Store -> Equipment -> Essences. Companion Pets are found under RIFT Store -> Pets -> Companion Pets. Minion Cards are found under RIFT Store -> Pets -> Minions. Costume Capes are found under RIFT Store -> Wardrobe -> Costumes. (scroll down to the bottom). Cape of the Eternal Tundra. Nightmare Tide notoriety vendors provide various runes that you can also find in RIFT Store -> Equipment -> Runes. Earring Runes: Requires The Onir notoriety. Neck Runes: Requires Atragarians notoriety. Trinket Runes: Requires Cerulean Rhenke notoriety. Focus Runes: Requires Pelagic Order notoriety. The minor runes require Honored and the major runes require Revered. There’s both Class-specific and Tank runes for each (other than the focus runes which give elemental resist). There are essences that specifically require The Ghar reputation that you can find under RIFT Store -> Equipment -> Essences. (first set is Level 60, the rest are Level 65 so you will need to adjust level filters accordingly). The Level 60 NT essences do not require notoriety. Level 65 essences do. First tier: Requires The Ghar: Decorated. Second tier: Requires The Ghar: Honored + “Nightmare III: Master” achievement. Third tier: Requires The Ghar: Revered + “Nightmare V: Master” achievement. “Nightmare #: Master” achievements can be viewed under Achievements (default key “h“) -> Planes -> Nightmare. They are earned by completing 18-20 of the achievements listed in the Master achievement. These relate to Nightmare Rifts. Tip: You can type /setwaypoint x y in your chat to mark co-ordinates on your map. Simply replace x and y with the co-ordinates. I.e. Ysolda is located at (2929, 7138) so you would type /setwaypoint 2929 7138. Note: Some of the dailies might be on a daily rotation. First up, the Marks of Notoriety vendor in Draumheim, Vakaros Izin (5471, 5591) located in Flargle Plaza gives Decrees for the various Nightmare Tide notorieties. Like Storm Legion, you need 10x Marks of Notoriety gained from completing Zone Events in your level range (or that give exp/green level to you) to turn in. Each Decree gives 100 notoriety in the chosen faction. Turning in 15x Commendations of Renown gives you the choice of 650 Atragarian, Cerulean Rhenke or Onir notoriety. This turn-in seems to be repeatable, not a daily. Most of the PvE and PvP weeklies can be obtained at Flargle Plaza outside Margle Palace in Draumheim around where Vakaros Izin is located. These do not reward notoriety but might still be useful to you given that they reward Void Stones, Abyssal Crusader’s Marks and/or Fragments of Horror mark currency. An exceptions to this are the Nightmare Rift Weekly which you get after completing all Nightmare Rift story quests up to Jandal Aykaus <Nightmare VII Scholar> and the Crafting Weekly in Choreburg crafting station, Draumheim which gives your choice of 650 Atragarian, Cerulean Rhenke or Onir notoriety. A Chronicle Daily can be found at Flargle Plaza in Draumheim and is given by Misty Rayne <Keeper of Chronicles> at (5505, 5545). This will provide notoriety of your choice for completing one of the Level 65 chronicles. The Level 65 Chronicle: Shadow From the Beyond gives 3 daily quests. Two for helping the Skelf and one for defeating the last boss. They give 50 notoriety each for the Skelf quests and 150 notoriety for completing the chronicle. 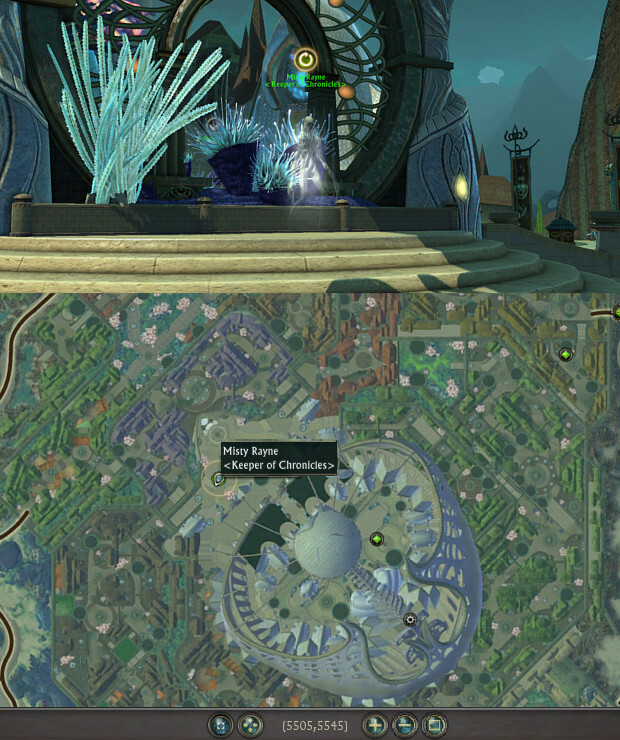 You can access the chronicle through the chronicle window (default key “j“). The Level 65 Chronicle: Rhen of Fate gives 3 daily quests. One for killing the Skelfs, one for freeing prisoners and another for killing all Hard Mode versions of the bosses. These reward notoriety of your choice. Sharf over at Tyrant’s Throne near the porticulum at Beachhead provides a daily that gives 650 NT notoriety of your choice. /setwaypoint 6128 9105. Involves one of 4 daily quests on rotation: “Dimensional Scramblers”, “Identity Theft”, “Returned to the Rhenke” and “The Gun Show”. Joy to the Fishes (Daily) by Hekhet (3925, 6487). 250 Atragarian notoriety. Reef Rebuilder (Daily) by Ysolda (2929, 7138). 250 Atragarian notoriety. Unorthodox Rescue (Daily) by Ysolda (2929, 7138). 250 Atragarian notoriety. Rifts of Goboro Reef (Daily) by Rivaldo (3012, 7048). 250 Atragarian notoriety + 250 Pelagic Order notoriety. Stop the World (Daily) by Fenvara (3913, 7894). 250 Atragarian notoriety. Repeatable: Forward Base zone events in Goboro Reef such as Parapet of Plenty gives 900-950 Atragarian notoriety. Ysolda is located in the south room on the first ‘bridge’ within the Atragarian Well in Goboro Reef. Rivaldo is located at the front of the ship at the top of the Atragarian Well in Goboro Reef. Menhir Hunting (Daily) by Sister Liralyn (4658, 2737). 250 Cerulean Rhenke notoriety. Ever Higher (Daily) by Roberta Stortberker (6583, 4199). 250 Cerulean Rhenke notoriety. Rifts of Tarken Glacier (Daily) by Planar Physicist Zroffin (4949, 3820). 250 Cerulean Rhenke notoriety + 250 Pelagic Order notoriety. Lost Research (Daily) by Research Bot 47-XL (3699, 4008) at Ghar Station Tau. 250 Cerulean Rhenke notoriety. (You must have completed the Ghar Station Tau storyline). Repeatable: Forward Base zone events in Tarken Glacier such as Corsair’s Castle gives 900-950 Cerulean Rhenke reputation. Nightmare I: Waking Terror (Daily) by Mehera Surin (5549, 5477). 250 The Ghar notoriety. Nightmare I Challenge: Layers of the Unconscious (Daily) by Mehera Surin (5549, 5477). 250 The Ghar notoriety. Nightmare II: Parasitic Dreams (Daily) by Otriga Zamisht (5546, 5478). 250 The Ghar notoriety. Nightmare II Challenge: Sleep Deprivation (Daily) by Otriga Zamisht (5546, 5478). 250 The Ghar notoriety. Nightmare III, IV and V (Daily) and Challenge (Daily) also give 250 The Ghar notoriety from respective NPCs. Weekly: Cerebral Catharsis (Weekly) by Jandal Aykaus <Nightmare VII Scholar> in the same location as the other Nightmare Rift NPCs at Ghar Station Mem or Flargle Plaza. This gives 250 The Ghar notoriety as well as 500x Abyssal Crusader’s Marks, 100x Fragments of Horror and 2,500x Void Stones. Repeatable: Forward Base zone events in Draumheim such as Molten Keep gives 900-950 The Ghar notoriety. Note: You can only pick one of the Nightmare Rift dailies. Nightmare NPCs appear at Ghar Station Mem and at Flargle Plaza in Draumheim. Most of the PvE and PvP weeklies can also be obtained at Flargle Plaza outside Margle Palace in Draumheim. These do not reward notoriety. Manugo League notoriety is gained from doing the Manugo daily and from chest/corpse at the last boss (sometimes a random boss prior like Skylla in Citadel of Insanity) of Level 65 Expert Dungeons. Daily Dopamine (Daily) by Hekhet (3925, 6487). 250 Manugo League notoriety. It’s Strangely Addicting (Daily) by Arlana Eshen (5539, 6374). 250 Manugo League notoriety. You Should Really Seek Some Help (Daily) by Research Bot 47-XL (3698, 4008). 250 Manugo League notoriety. The High Seas (Daily) by Bucket List (5759, 5672). 1 with Manugo League (might be more for those with NT pack). (NPC is near Draumheim Margle Palace porticulum). Repeatable: Expert NT Dungeons gives auto-consumed Manugo Decree consumables that give 100 Manugo League notoriety. These drop from the last boss of each Expert NT Dungeon and sometimes other bosses as well (like Skylla in Citadel of Insanity). You must loot the bosses body or chest yourself so pay attention to each boss in NT Experts and don’t just let someone else loot the boss for the gear roll. Repeatable: Goboro Reef Instant Adventures give a small amount of Manugo League reputation. Note: Players who purchased a Nightmare Tide pack gain significantly more notoriety than other players. Rifts of Draumheim (Daily) by Cata Notia (4827, 5044). 250 The Onir notoriety + 250 Pelagic Order notoriety. Trivia Night (Daily) by Yance Neville (4851, 5024). 250 The Onir notoriety. All Gathering/Crafting Dailies (Daily) by Elena Lyra (5840, 5521). 250 The Onir notoriety per daily. Note: There seems to only be one wordorder per gathering/crafting profession. Note: Pelagic Order is also gained from killing rift creatures in Rifts, including Nightmare Rifts. You won’t get much per mob, but bosses tend to give more. Know of a quest or method to obtain notoriety that isn’t mentioned above? Please post a comment below with any information you can provide! Thank you! Interested in other points of interest in Nightmare Tide? Check out the Porticulums + Point of Interest maps here. Thanks for the info heyhomes! Unfortunately they only gives 2 Manugo Rep for those without Nightmare Packs. 63 Manugo rep ? with nightmare pack I am only getting 11 with patron buff from these same 65 elites. You have me worried that I am missing out somehow on more rep. They might have changed the rep gain from the Elites since the time of heyhome’s post. Probably after that time when they removed the Elites entirely for a period of time before bringing them back in. There’s also an Onir rep daily quest at the Ghar Station, at the same NPC as the Manugo daily. Manugo League notoriety can also be gained from pvp in the Ghar Station Eyn Warfront. Holding the deadly number while clicking on one of the manugo stations provides small additional amounts.